For buildings with central cooling plants, a chiller can be the single largest consumer of electricity, adding up to significant costs. 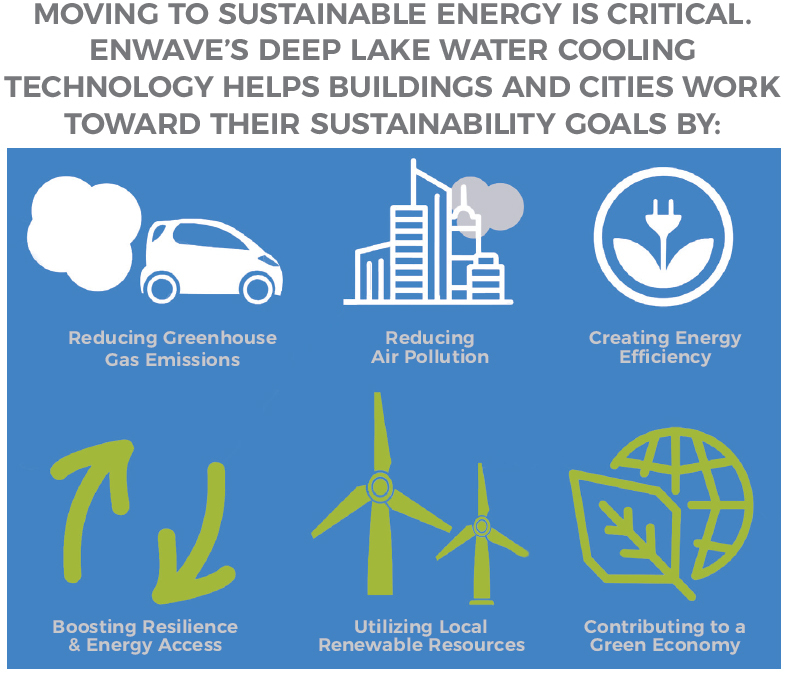 To help manage water and cooling expenses, reduce your carbon footprint and meet corporate sustainability goals, Enwave offers Deep Lake Water Cooling (DLWC), a sustainable, energy-efficient solution. To harness the renewable thermal energy of Lake Ontario to provide sustainable and efficient energy solutions that help reduce costs. 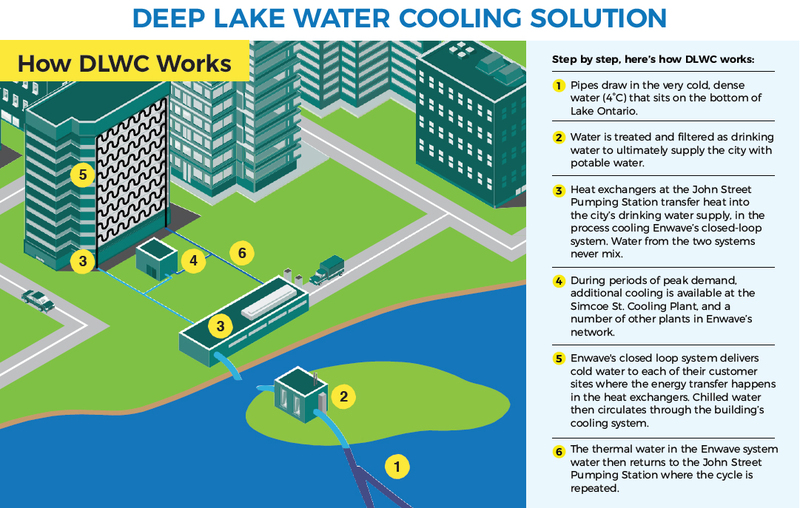 DLWC harnesses the renewable cold temperature of the water at the bottom of Lake Ontario to cool buildings. 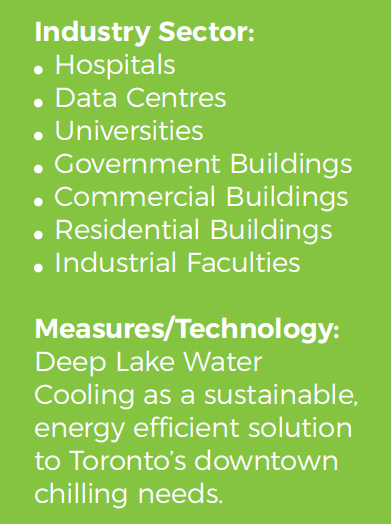 It delivers clean, reliable and energy-efficient cooling to 71 buildings (and counting) in Toronto’s downtown core. 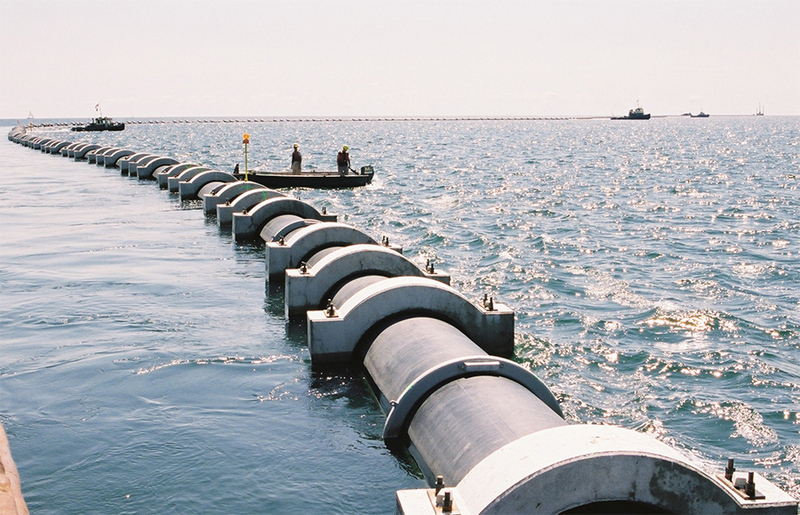 a five-km-long intake system that draws 4°C water from 83 metres below the surface of Lake Ontario. The Enwave closed loop system extends throughout the downtown core to customer buildings. At the building sites, an exchange of energy is made via heat exchangers the Enwave closed water loop to the cooling loop for the building. At these locations, the Enwave water is slightly warmed and the building’s cooling loop is cooled. The Enwave closed loop then returns the warmed water to the John Street Pumping Station where the process is repeated. Enwave has partnered with Toronto Hydro to provide incentives to implement DLWC in buildings. Contact our energy experts today at info@enwave.com for more information.